Schwarzwälder Kirschtorte (Black Forest Cherry Cake) is a dessert commonly found in southern Germany, and one that we made a few months ago. But it would have been time consuming to slice and serve during our Oktoberfest party, so we turned the traditional cake into a cute little cookie. The ingredients are basically the same, but instead of a fluffy cake, you get a dense cookie. Really, it’s close to the consistency of a brownie. 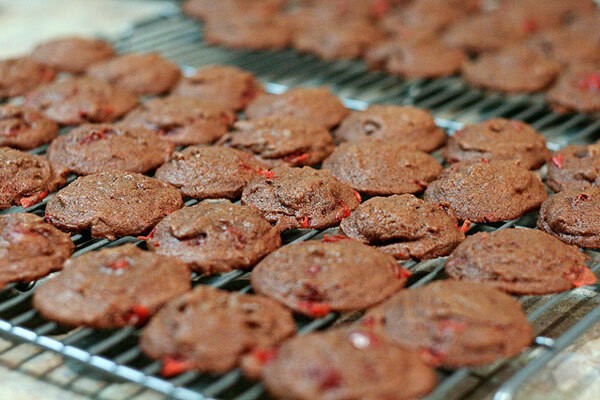 The batter includes chunks of cherries and chocolate chips that melt perfectly while baking. We couldn’t help but sample one straight out of the oven, and it was delicious. In fact, I think I preferred the cookie without any frosting. But that wouldn’t have been very festive, right? So I whipped up a simple frosting of butter, marshmallow cream, confectioners sugar, and cherry juice. And I got to break in my new pastry bag. After the frosting set, I stored them in an airtight container until just before our guests arrived. Thanks to my sister for so neatly arranging the display! The Germans sure nailed this flavor combination. 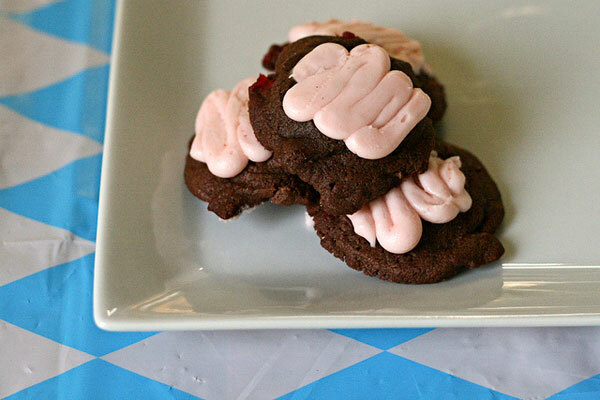 Who doesn’t love sweet chocolate and tart cherries? Whisk flour, cocoa, baking powder, and salt in a medium bowl until well blended. 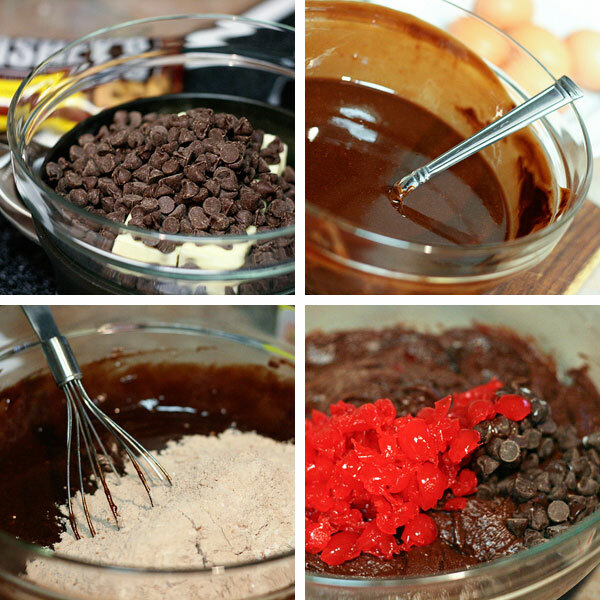 Melt butter and 1 cup chocolate chips in a medium saucepan over low heat; stirring constantly. Remove from heat and cool 10 minutes. Whisk in sugar, eggs, and vanilla until blended. Add flour mixture and stir until smooth. 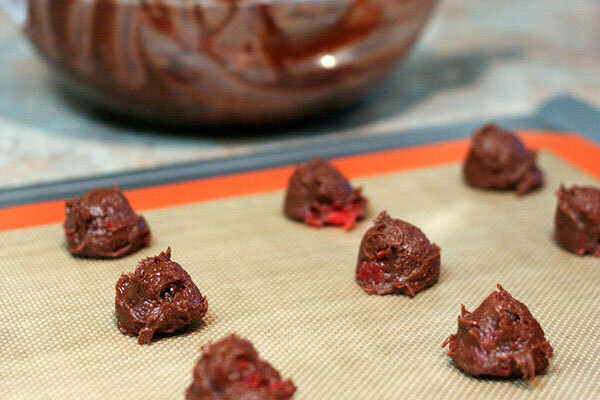 Stir in chopped cherries and remaining 1/2 cup chocolate chips. Drop tablespoons of dough 2 inches apart onto ungreased baking sheets. Bake 10 to 12 minutes until toothpick comes out clean. Remove to rack to cool completely. For frosting: Beat ingredients in a medium bowl with mixer on medium-low speed until fluffy. Add 2 tablespoons cherry juice. 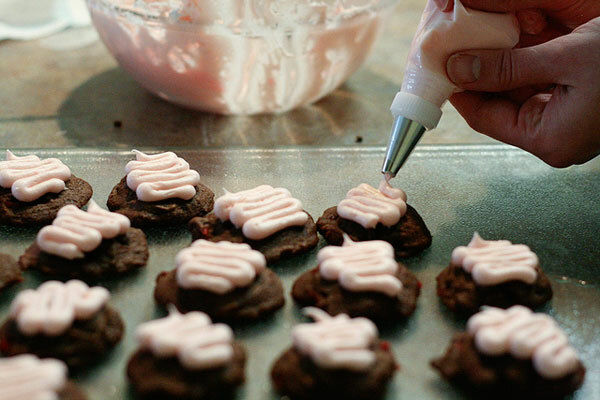 Pipe or spread frosting onto each cookie. Let frosting set about 2 hours. oh my gosh these look AMAZING! And the presentation is ridiculous. You guys are something else. Wow, these look so cute and sound so delicious! 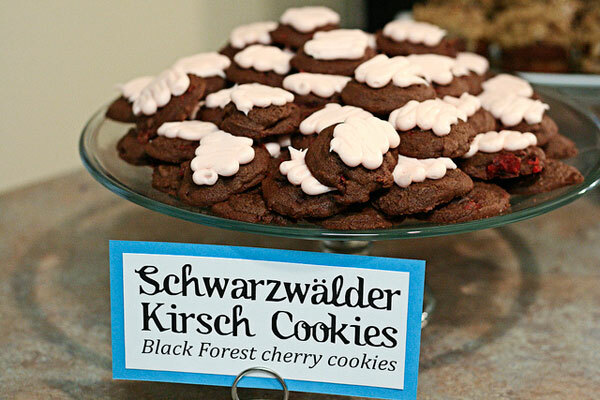 Fiance doesn’t like cherry but he does like all things German … at any rate, these will be included in our holiday baking, if only for me! I agree with Kat … the presentation is amazing. Is that a silpat baking sheet you are using? I have been using mine and am in love! Everything from chicken to cookies to sweet potato fries. And these cookies look OUTSTANDING!!! Yay, silpat! 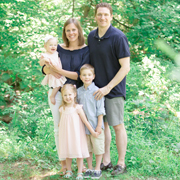 We love ours, too. I am definitely going to make these. Love the chocolate -cherry combination. Hi. I made these and they tasted great but the cookies were kind of fluffy not flat. Does anyone know what I did?